Tullivers is committed to protecting your privacy and data. We will use the information that we collect about you in accordance with the General Data Protection Regulation 2018 and the Privacy and Electronic Communications Regulation 2003. Tullivers is an independent company registered in England and Wales, number: 10347852. We aim to be clear when we collect your data and not do anything you wouldn’t reasonably expect. 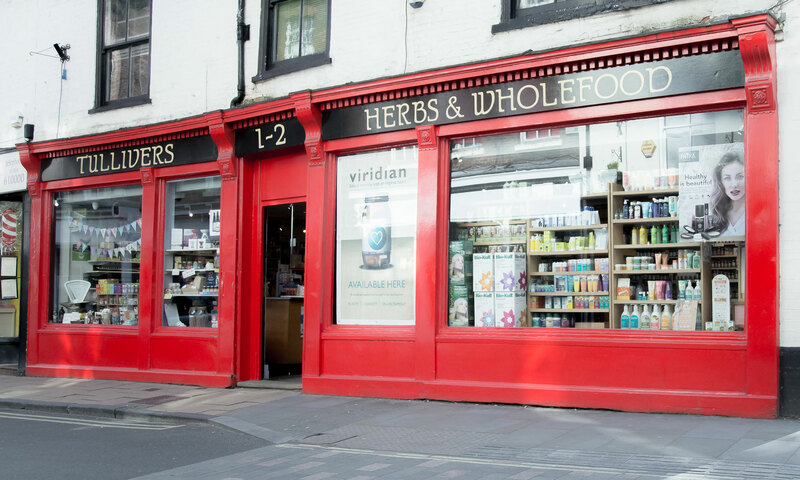 Developing a better understanding of our customers through their personal data allows us to make better decisions about how we develop our stock and to work more efficiently, all of which help us to reach our goal of bringing interesting and helpful health products to the people of York. We maintain a record of your transaction history, but we never store your payment card number. We keep a record of the emails we send you and we may monitor whether you receive and open them so that we can make sure we are sending you the most relevant information. To undertake anonymised research into our customers so that we can improve and refine our stock and marketing methods. If you are successful in your application the associated administrative assessment of your application will be kept in your staff record file. We will also ask for and keep the following personal data about you: Name, address, date of birth, educational details, previous employment history and qualifications and for safety reasons any relevant information that you have disclosed about your medical history and next of kin. If appropriate we may ask to see proof of your right to work in the UK. We will also collect financial data (your bank account and HMRC tax code) so that we can pay you and this information will be shared with pension companies and HMRC. If you are unsuccessful in your application, your data and the attached information that you submitted will be marked for deletion and will be disposed of in line with our timed deletion framework. If you are the employee of a supplier or potential supplier and have given your name, email or any other personal data to identify you for the purpose of correspondence, that data will be stored on our accounts system and will be associated with any correspondence between us and your organisation, for example, quotes for services, invoices, orders and statements. If you engage with or follow us on social media, for example on our Facebook pages, Instagram or Twitter, we will have access to any information that you have agreed to share on that channel. This may include your name/user name, demographic information and access to content that you have posted. We may use this information for statistical purposes to help us understand the size or demographic make-up of our customer base and we may use contact details to send you a response to something that you have raised. If you do not want to receive information by post or email about new products or company news you have the option to change any of your contact preferences at any time by clicking unsubscribe on email bulletins or contacting us to ask for your details to be removed. We will not share or sell your personal details with any other third parties without your agreement unless required in order to fulfill our contract with you, or allowed by law. In general third party providers used by us to fulfill our contract with you will only collect, use and disclose your information to the extent necessary to allow them to perform the services that they provide for us. These providers include the systems used for email distribution services. We have agreements in place with providers to ensure that your data is secure at all times, and cannot be accessed or used for any other purpose. We will never sell your personal data to an agency or other companies. The Tullivers website and newsletters may contain links to other websites. Although the majority of them are our suppliers or sympathetic businesses and charities that we support we are not responsible for the privacy practices of them and you should read their own privacy information before providing them with your personal information. If you join our mailing list we will tell you about activities, products, special offers, opportunities, events and other health related news. Occasionally we may include information in these communications from our suppliers. You can opt out from these communications at any time. Every email we send you tells you how you can unsubscribe. If you wish to be taken off postal lists you can contact us to do so. Your personal data will be held and processed on Tullivers’ systems. Where possible we aim to keep a single record for each user or customer. Your data is always held securely and access to information is strictly controlled. We do not process data outside of the UK. We do not keep data for longer than it is needed. An annual process is in place to monitor deletion of records and associated information and to ensure that data is not kept for longer than is deemed necessary. To exercise your rights in relation to the data that we hold on you please contact the Data Officer at Tullivers. Please note that if you choose not to share your data this may affect Tullivers’ ability to provide the services you request. For example, we would be unable to process an application for an order from you if you do not provide your contact information. WRITE: Tullivers, 1-2 Colliergate, York, YO1 8BP.